A delightfully different soup that will surprise your taste buds by how good it really is!! 1. Spray a 5-quart slow cooker with non-fat cooking spray. 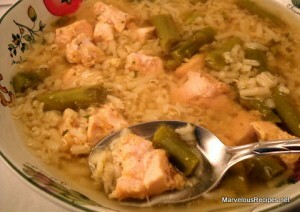 In the slow cooker, combine the broth chicken breasts, rice & sauce mix, asparagus, parsley flakes, salt, pepper and bay leaves. 2. Cover and cook on Low for 9 hours or on High for 4-1/2 to 5 hours. Remove the bay leaves before serving. Makes 20 (1 cup) servings.